This page shares with you the Dragon1 vision on what is ea and effectively increasing the performance of the enterprise. Positioning Enterprise Architecture (EA) as bridge between Enterprise Strategy and Business Transformation is becoming more and more common. The Enterprise Strategy states what the owner/client and stakeholders want to achieve. The EA is a conceptual and integral design that uses Enterprise Strategy as Requirements. The programs and projects that carry out the Enterprise Transformation use views or visualizations of the EA as guiding frameworks. EA, therefore, directs business change. Checkout all the examples of EA products here. Or see an interactive version of the Blueprint for a Hospital on the watch page. Example Conceptual EA Blueprint of a Digital Business Model: Strategy on the left, Architecture in the middle, Transformation on the right. What Enterprise Architects now encounter is that the necessary input they need for EA, the enterprise strategy, is often fragmented, inconsistent, having no status, without ownership, outdated, unfindable, a big secret, and inaccessible. It is a real challenge for Enterprise Architects not to become the next strategy developer but only catalyzer of the process of increasing coherence and consistency in enterprise strategy. If an Enterprise Architect does this process well he (or she of course) will have at a certain moment in time a perfect starting point for designing the EA. After creating the EA (or other architectures like a solution architecture) the architects have the job of creating communicative & visual products that help to tell the story and get the EA actually used in programs and projects of change. Currently one of the biggest problems architects have is that their EA products aren’t used because they are too hard to understand for project managers and project workers. This page shows a HOW TO for creating a solid base Enterprise Strategy as input for EA and HOW TO for creating communicative and visual EA products to get architecture used in projects. The HOW TO’s are based on the open EA Method Dragon1, using its Enterprise Performance Framework and Operational Intelligence Framework, and practical experience in Health Care, Finance, Government, High Tech, Telecom and Manufacturing environments. EA Principles are high level statements of the fundamental values that guide Business Information Management, Information Technology (IT) decision-making and activities, and are the foundation for both business and IT architectures, standards, and policy development. These principles are general rules and guidelines that may be subject to adjustments as the enterprise refocuses its objectives and mission. However, they are intended to be enduring and not prone to frequent amendments. They inform and support the way in which and Plymouth University sets about fulfilling its mission. In this Enterprise Performance Framework you see that the two most important parts of the strategy are the Objectives and Goals to realize and the directions to head to realize the goals. 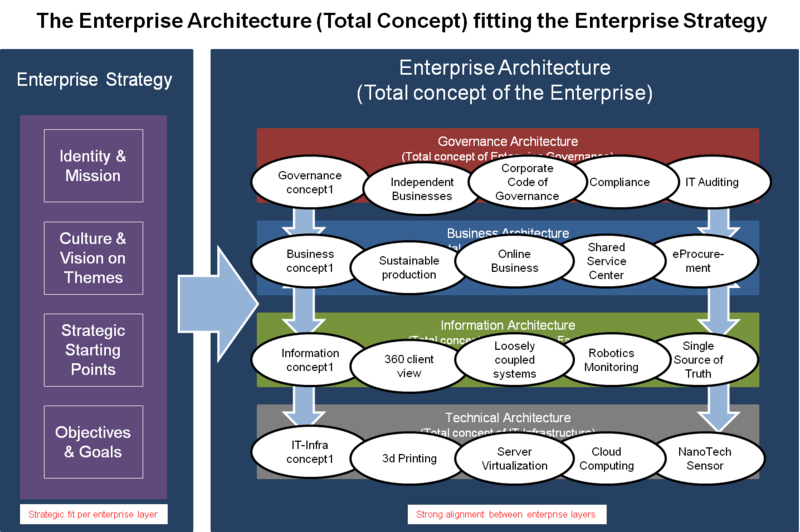 The enterprise strategy, as a coherent whole, is the perfect input for enterprise architects to create EA and other architectures, like business architecture and IT architecture. 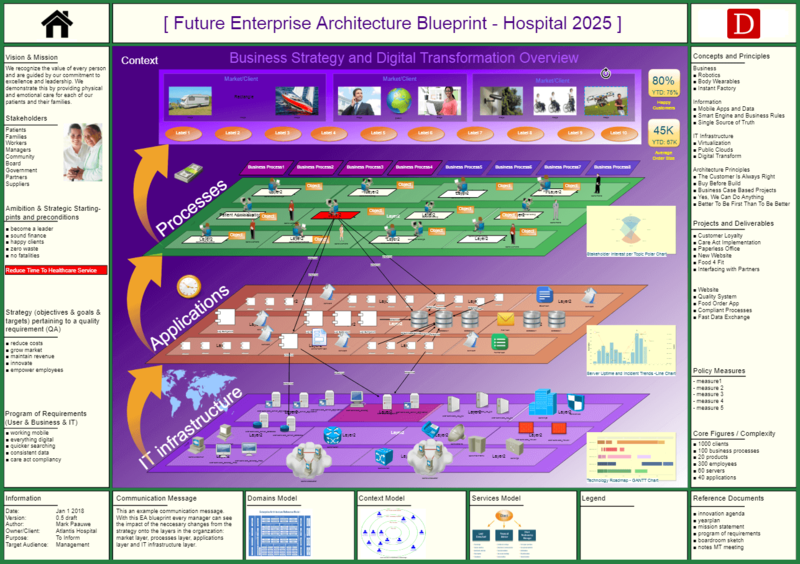 The most important EA products are the AS-IS and TO-BE EA Blueprints (an integral conceptual enterprise design) and the EA Framework Diagram. And on top of that per project, solution or change a Solution Architecture Blueprint. These products are used in enterprise transformation or business change. Projects make use of roadmaps, solution architectures and an EA to create perfect fitting solutions as a result. Changing or transforming the enterprise into these integrated solutions enables the enterprise to realize the business goals and objectives in the defined strategic direction. A brief Enterprise Performance example: if the goal is to become the world leader in selling bakery products online via social media, your program of change and projects will need a solution architecture and roadmap on how to embed social media as selling the platform for the enterprise. BTW: This sounds much simpler to do than it actually is! Enterprise Strategy can be defined as a set of coherent goals and the directions to head in order to realize these goals. That said one can recognize various entity classes present in every enterprise that together form the reference metamodel for Enterprise Strategy. Below you see the Reference Meta Model for Enterprise Strategy in the Dragon1 Open EA Method. Here you see entity classes that together make up a major part of your enterprise strategy. Now as enterprise architect it is your job to make sure that you create a Program of Requirements as input for an EA and solution architectures. Make sure that the enterprise strategy information is put in the program of requirements. Dragon1 Innovation Lab provides you with an EA Repository tool and Visual Designer tool with which you can enter and model all the information from various strategic documents you get and glue them together using this model as reference. You may have a different opinion about enterprise strategy. In that case, you easily alter the model to fit your vision on enterprise strategy. 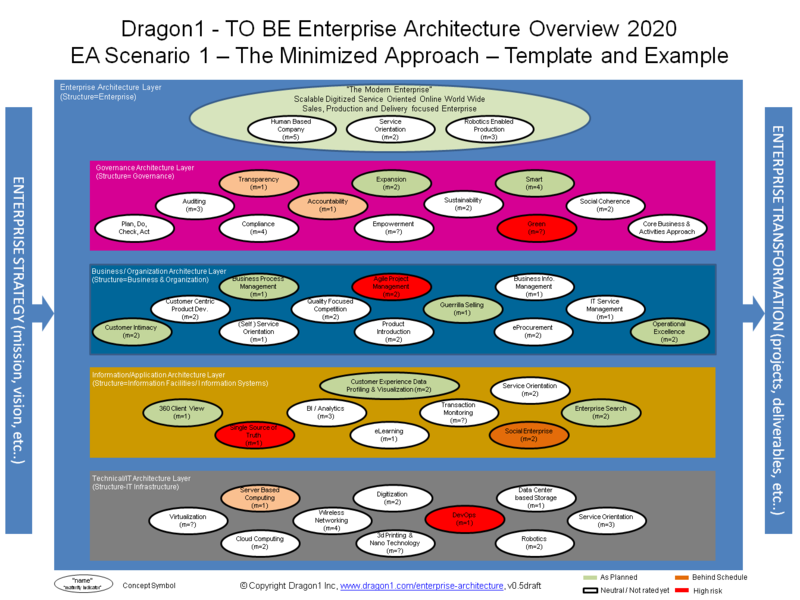 When Enterprise Architects request the Enterprise Strategy in a coherent and consistent form so it matches the Dragon1 model above they often get a zip file with documents and need to create the coherent and consistent version themselves. If enterprise architects do not get Enterprise Strategy handed over by the owner/client and stakeholder as input, they might get on a drift. Meaning: the architects start themselves filling in the blanks and without the intention of doing so, they actually become strategy designers. Now if you as an architect have blanks or gaps in the enterprise strategy, you should better create visualizations for the stakeholders and show them there are gaps requesting them to fill them in. And as long as the stakeholders are not ready, you work with assumptions. It is all right you do this, but make sure they know it. Dragon1 open EA Method defines EA as the total concept of your enterprise consisting of a coherent set of constructive, operative and decorative governance, business, information and technology concepts. 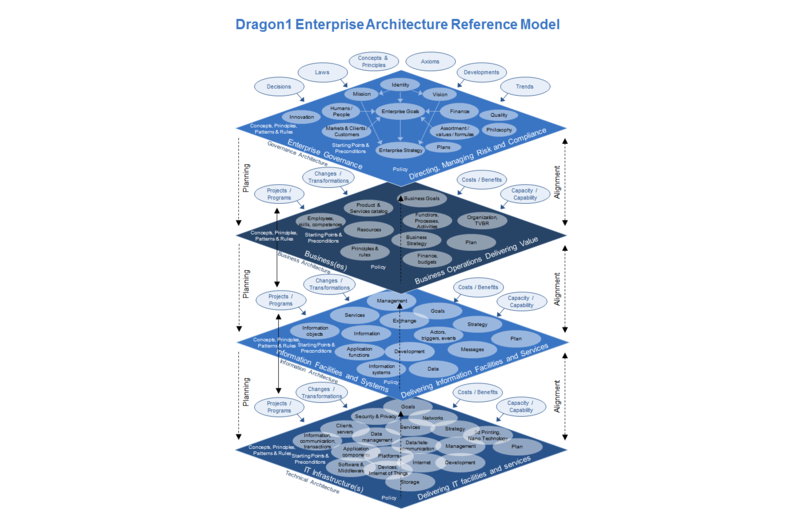 In short, Dragon1 defines EA as a conceptual blueprint for your enterprise. Architecture equals Concept! Below you see an example conceptual model, an EA overview. 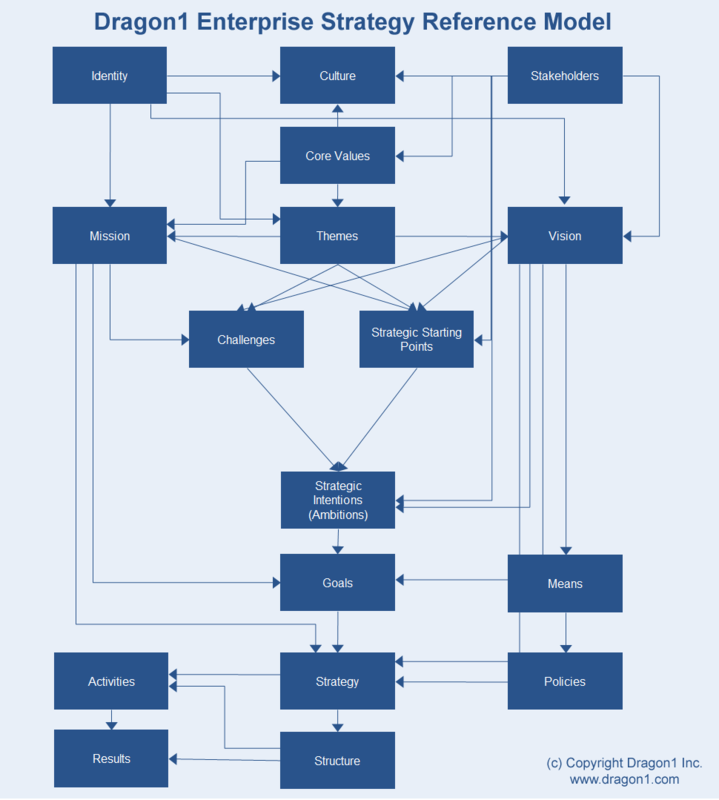 It is the architect's quest to find the right concepts for the enterprise strategy. Below you see another example of a mixed conceptual & logical reference model for an enterprise with common entity classes that are present in almost any enterprise. It is these entity classes that need to be recognized and modeled by the enterprise architect. An enterprise architect is defined as the designer of total concepts for enterprises (EA) and solutions (solution architecture). So he needs a specialized design tool in order to do his job excellent. Dragon1 Innovation Lab has an EA Repository tool and Visual Designer tool with which an enterprise architect can design any EA and any solution architecture product he needs and likes: landscapes, blueprints, roadmaps, visions, maps, diagrams, matrices and more. As Enterprise Architect, Business Architect, Information Architect and Technical / IT Architect you design total concepts for an integrated solution for the enterprise, to improve its performance. When designing an architecture (total concept), you need to use requirements from stakeholders. The enterprise strategy must always be used by enterprise architects as the most important set of requirements. These total concepts are designed at four different levels of abstractions: conceptual, logical, physical and implementational level and in close collaboration with the owner client and stakeholders. In the model above you see common logical level entity classes. On this page about EA Core Reference Model you can read all about the various levels of abstractions. You will read enterprise architects use concepts, principles and patterns and create building blocks so the high-quality integral solution can be built and implemented. What we will mention here is that the design of every architecture will result in tangible products like: blueprints, landscapes, visions, impressions and diagrams. It is with these products architecture is communicated to the various stakeholders, like project workers who actually build the solutions and implement change. At this point the enterprise strategy has served as input for EA. And solution requirements from stakeholders have served as input for solution architectures. And blueprints, landscapes, maps, diagrams, matrices etc.. are created to communicate the architecture / total concept designs. Now it all comes down to realizing/building the solutions integrally and implement them as change, transforming the enterprise for the better. 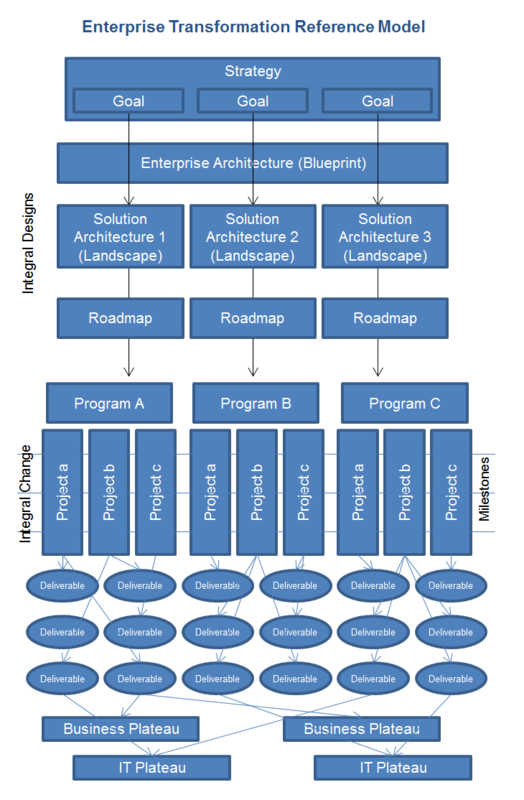 In the Dragon1 Enterprise Transformation reference model below you see that integral design and integral change are key. And that finally, the projects must have deliverables as outcomes that can be placed in a business or IT plateaus. A best practice to work in a project effectively with architecture and designs and keeping them conforming to the integral ideas is to create roadmaps. A roadmap dictates what should be done when at best and when it is needed by something else. Dragon1 Innovation Lab is your online Project Management Tool to map, monitor and manage architecture, solutions and projects in an excellent way. You can create or even generate product break down structures and work break down structures from your solution architecture and provide your stakeholders with interactive click-through roadmaps so their hunger for progress information can be fulfilled any time they want. Dragon1 also provides you with an innovative and interactive Project Landscape Map so you can visually control risks in your project. New technologies, like 3d printing, the Internet of things and smart machines are arising quickly and mixing up with recent technologies like big data, mobile devices and the cloud. The challenge for modern enterprise architects (digital business architects) is to try to deliver new business value for their organizations in an exciting new way. The more quickly you as organization apply these new technologies the more you will be on the right side of the game-changing in various industries. Digital Business is the new word, meaning your organization is becoming more and more digital or virtual on the internet, whether you want it or not. Your competitors will do so! And if your business becomes more digital it is very wise to explicit it in models and visualization to get a better grip on it. The architects for these new type of organizations are called Digital Business Architects. Digital Businesses have new opportunities for innovation, for growth and thus for competitive advantages. The Digital Business architect is the one to lead the transformation of your organization. And for that to happen successfully he must place EA between enterprise strategy and enterprise transformation. Enterprise architects, strategists and IT innovation teams are the Digital Business Architects with exciting time ahead. Let us all look forward to the new ventures that are bound to arise. Are you interested in doing EA on Dragon1? Purchase your Dragon1 user license here and start creating your first blueprint, landscape or roadmap within weeks, supported by our service desk team.